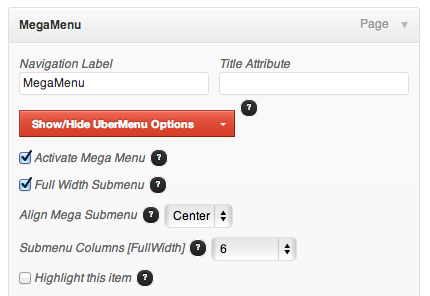 Out of the box, UberMenu puts no restrictions on submenu column widths (beyond that they can’t exceed the width of the submenu). If you don’t place any restrictions on these submenu columns, the columns are considered Natural Width. If we specify exactly how much of the row they should take up, they are Percentage Width. Notice that the first column is much larger than the others, due to the How I Met Your Mother item title. You can use natural width columns with either full width or natural width submenus – but normally natural width submenus work best in this case. If your last column is falling on to a second line, and your submenu alignment is set to “Center”, but touches the right edge of the menu bar, try setting your submenu alignment to “Right” instead to make the columns align properly. In this case, note that the extra long title in the first column is forced to wrap, rather than expand the column, as all columns take up exactly 25% of the submenu width. In order to use percentage columns, set your top level menu item to enable Full Width Submenus and set the Submenu Columns [Fullwidth] value to your desired number of columns (up to 7). Note that percentage width columns only work with full width submenus. This is because using percentage width columns with natural width submenus would create a circular dependency (the width of the columns would depend on the width of the submenu, but the width of the submenu would depend on the width of the columns). You could, however, customize your submenu and set an explicit width less than that of the menu bar and use columns with non-full-width submenus, but that is outside the scope of this document.